You know that a film is completely confident in itself when the opening 10 minutes includes the biggest, most impressive stunt of the year. It has every right to be because in a series that started off shaky, it has grown into a roller coaster ride of impressive stunts, complex plotting that smart enough while not alienating the audience and a cast oozing with charisma. After hitting a real height with Ghost Protocol, could this new entry equal it? In fact, it beats it. IMF are on the verge of folding, thanks to CIA secretary Alan Huntley. Their only hope of keeping going is for Ethan Hunt and the team to prove that a secret organisation called The Syndicate, made up of rogue agents thought to be dead and led by mastermind Solomon Lane, exists. This is an almost impossible mission for Hunt, as the CIA are tracking him down, a British agent, Ilsa Faust, who, one moment is helping, the next switching sides and Lane seems one step ahead of him, it’s going to take the rest of the team to go rogue as well. 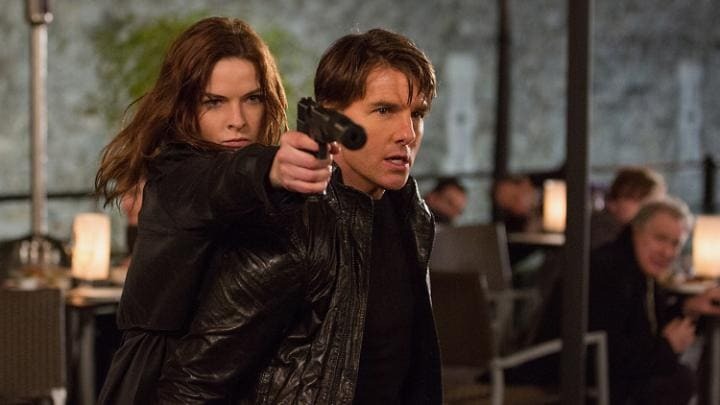 With new director Christopher McQuarrie on board after directing Jack Reacher, as well as taking script duties, and with Ghost Protocol still fresh in everyone’s memory, he has his own impossible mission ahead. This has to be bigger, more impressive than the last. How are you going to beat the tension of the Burj Khalifa tower scene? You start the film off with your star hanging onto the outside of a plane. So in the first 10 minutes, the adrenaline is pumping to max, leading into the now legendary theme tune and we are off. In fact, the film never takes a wrong foot for the whole of its 131 minute running time. While the plot involving double agents, triple agents and who do you trust, never gets too bogged down, it relies on more incredible set pieces, from an underwater sequence not too dissimilar to the computer breach in the first film, to a nail-biting car/bike chase through the streets of Turkey, the film becomes relentless in its way to excite its almost baying audience. Kudos to McQuarrie for then turning the finale on its head and completely underplaying the set pieces to a simple chase through the alleyways and side roads of London. Again, this proves just how confident those involved are with their product. In fact, you leave feeling very satisfied, as the past few hours have kept your interest, made you hold your breath and generally done exactly what you would expect from a big Summer blockbuster. The cast seems happy in their various roles. Tom Cruise still has more charm and charisma than any man has a right to have, while still managing to make for a believable action star. The knowledge that it is him doing those amazing stunts and not some lookalike stunt double, just makes you warm to him even more. Simon Pegg still adds the comedy factor as nerdy Benji, while Jeremy Renner’s William Brant, has become more of a suit than a field agent, which works to balance the power between him and Cruise. New editions include the always watchable Sean Harris as Lane, a weasel like villain with a whispering voice which, unintentionally reminds you of Baron Greenback from Danger Mouse. Yet after years of playing thugs, it’s nice to see him underplaying this bad guy. Even more impressive is Rebecca Ferguson as Ilsa, a woman who is not only beautiful but extremely deadly. She handles the action sequences brilliantly and it would be a crime if they don’t bring her back for the next outing (which surely will happen). 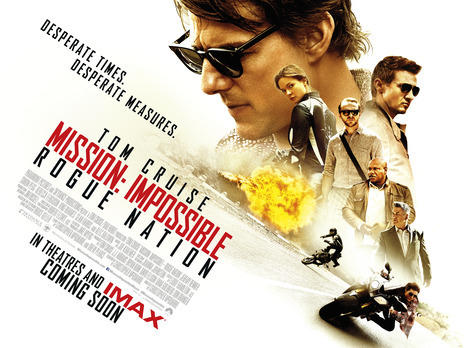 Mission: Impossible – Rogue Nation is a Summer blockbuster through and through and does not disappoint in any way. With a new Bond on the way and The Man From U.N.C.L.E still to come, this franchise has set the bar high for pure adrenaline rushes. It’s now over to them to see if they can at least match this.